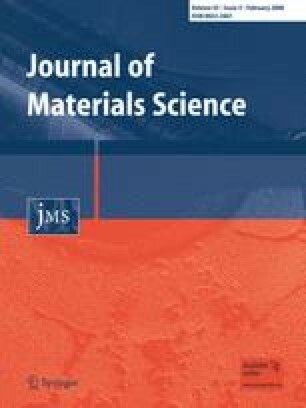 The copper matrix composites reinforced with SiC particulates (Cu/SiCp) were fabricated using a powder metallurgy method with the addition of 0.5, 1.5, 2.5, and 5 wt.% Fe. The microstructure and properties of the composites were studied. The results of this investigation revealed that the addition of Fe improved the interface bonding and mechanical and thermal physical properties of the composites. The fracture mechanism of the Cu/SiCp composites was found to change from interface de-bonding to matrix tearing due to the addition of Fe. The authors would like to thank Instrumental Analysis Center of SJTU for SEM observation and the financial support from National Natural Science Foundation of China under grant No. 50271043.